Over the course of this Photo 365 project I have probably taken the most pictures of two structures – the Saint Paul Union Depot and the Saint Paul Cathedral. They are both close to home, easily accessible, and strikingly beautiful to me. This morning, as I sat at a stoplight looking at the building and clouds overhead, I realized I hadn’t yet captured the dominating immensity of the cathedral, towering on a hill that overlooks Saint Paul. This is day 348 of Photo 365. 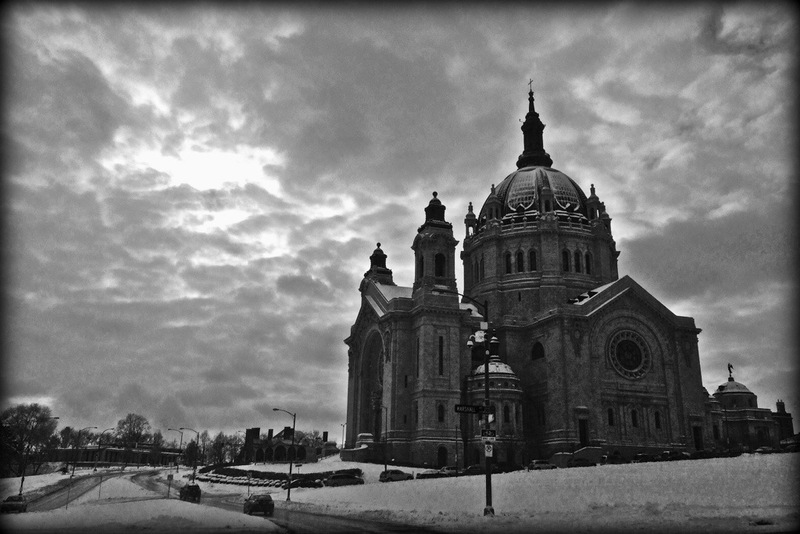 This entry was posted in Photography and tagged cathedral, Saint Paul. Bookmark the permalink. For as many times as the Cathedral is photograph (let alone seen) it usually offers up another look, another mood. This shot is great! The cathedral is strength under an eerie sky, piercing a hole to heaven. Yr in the home stretch, C! Eager to see the the last 17. Love this comment, and well said! Thank you! Yes, both are unique and striking. After living within a mile of each building for the last 14 years, I still see new things. Love that!